Submitted by JoeKeresztury on Sun, 10/02/2011 - 08:26. A smoke detector (smoke alarm) is a device that detects smoke and gives out a sound and/or a visual signal to alert homeowners to the threat of a fire. According to the Consumer Product Safety Commission (CPSC) almost two-thirds of reported deaths caused by home fires in the last few years resulted from fires in homes that lacked smoke detectors or functioning smoke detectors. Older homes are more likely to lack an adequate number of smoke detecting devices since they were built before requirements were updated to the current requirements. In nearly a quarter of residential fire deaths, smoke detectors were present but the sound did not function. Sixty percent of these failures were caused by the power source having been removed due to false alarms. Many of the more than 300,000 residential fires in our country annually are preventable by following a few simple safety tips. 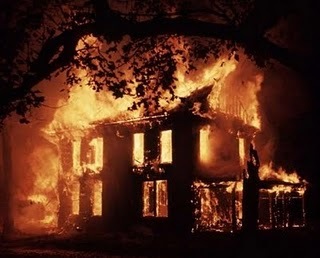 Every year in the United States, around 3,000 people lose their lives in residential fires. Most fire related deaths are caused by smoke inhalation, rather than as a result of fire burns. 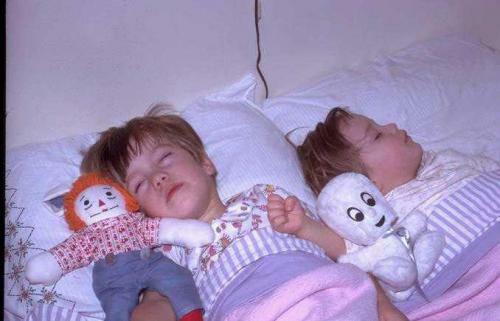 within a home, including basements, but not crawlspaces or uninhabited attics and in each bedroom, as most fires occur during sleeping hours. The smoke detector if not installed on the ceiling should be on the wall with the smoke detector between 6 to 12 inches from the ceiling. Smoke alarms should not be installed near heating or air-conditioning supply and return vents, near a kitchen appliance, near windows, ceiling fans or bathrooms equipped with a shower and/or tub. They should not be installed where ambient conditions, including humidity and temperature, are outside the limits specified by the manufacturer's instructions, within unfinished attics or garages, or in other spaces where temperatures can rise or fall beyond the limits set by the manufacturer or where the mounting surface could become considerably warmer or cooler than the rest of the room, such as an inadequately or non insulated ceiling below an unfinished attic or in dead-air spots, such as the top of a peaked roof or a ceiling-to-wall corner. Power for the smoke alarms may be hard-wired directly into the building’s electrical system, and/or it may come from a battery. Hard-wired smoke detectors are more reliable because the power source cannot be removed or drained, although they will not function in a power outage. Battery-operated units often fail because the battery can be easily removed, dislodged or drained, although these units can be installed almost anywhere. Older buildings might be restricted to battery-powered designs, while newer homes generally offer more options for power sources. If possible, homeowners should install smoke alarms that are hard-wired with a battery backup, especially during renovations, a remodeling project or new construction. Smoke detectors should also be interconnected so that if one becomes triggered, they all sound in unison. Interconnected smoke alarms are typically connected with a wire, but new technology allows them to be interconnected wirelessly. The National Fire Protection Agency requires that smoke alarms be AFCI-protected. -Parents should stage periodic night-time fire drills to assess whether their children will awaken from the alarm and respond appropriately. Children can sleep right through the sound of a smoke alarm and the elderly, many of whom live alone, may not hear an alarm. Because children, older people, and those with special needs may not wake up to the sound of a smoke alarm, parents and caregivers must incorporate this possibility into the home fire escape plan. When practicing your home fire escape plan, make sure all escape routes are clear. Correct such problems as blocked exits, jammed locks or barred windows. -Never disable a smoke alarm. Use the alarm’s silencing feature to stop nuisance or false alarms triggered by cooking smoke or fireplaces. Daylight Saving Time. Most models emit a chirping noise when the batteries are low to alert the homeowner that they need replacement. -Smoke alarms should be replaced when they fail to respond to testing, or every 10 years, whichever is sooner. The radioactive element in ionization smoke alarms will decay beyond usability within 10 years. -If you have any questions or concerns related to smoke alarms or fire dangers in the home, consult with an inspector during your next scheduled inspection. -Smoke detectors should be replaced if they become damaged or wet, are accidentally painted over, are exposed to fire or grease, or are triggered without apparent cause. -Note the sound of the alarm. It should be distinct from other sounds in the house, such as the telephone, doorbell and pool alarm. -Never leave cooking equipment unattended. 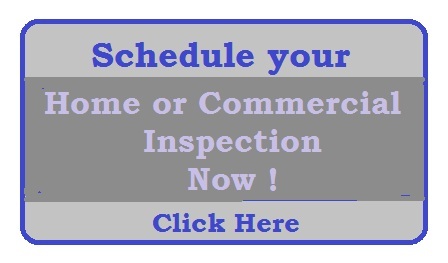 -Have a professional inspect your heating, cooling, and water appliances annually. -Inspect electrical cords for signs of wear,cracks, or age, and keep lighting away from combustibles. -Use caution with candles, lighters, matches,and smoking materials near upholstered furniture, mattresses, bedding, etc. 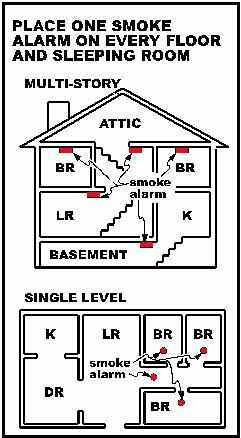 Smoke detectors are invaluable, life saving devices to protect your home and family. Properly installed and maintained smoke alarms in the home are considered one of the best and least expensive means of providing an early warning of a potentially deadly fire. Smoke alarms save lives, prevent injuries, and minimize property damage by enabling residents to detect fires early in their development. The risk of dying from fires in homes without smoke alarms is twice as high as in homes that have working smoke alarms. 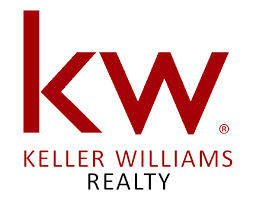 When purchasing your San Antonio area home, your Home Inspector will check that the smoke detectors are present at the currently required areas and functioning. Afterwards you can prevent tragedies simply by testing and maintaining your smoke alarms and practicing a fire escape plan. 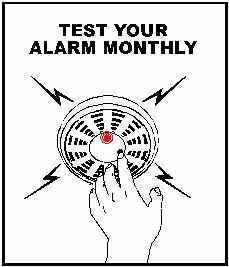 All smoke alarms in your house should be tested once a month and their batteries replaced annually. Every family should develop a firee scape plan and practice it at least twice a year. The U.S. Consumer Product Safety Commission (CPSC) recommends these measures because working smoke alarms and a fire escape plan will increase your protection in case of a fire. 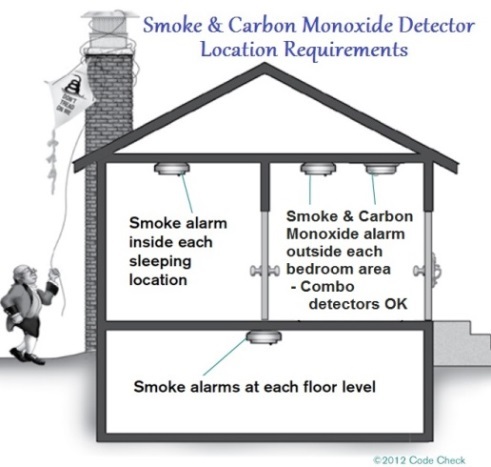 Image shows required areas for smoke and carbon monoxide detectors in a home. 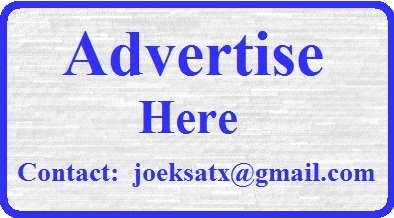 By Joseph W. Keresztury, San Antonio area Home Inspector and Consultant. Info contributions along with Photos and Images by Consumer Protective Services Commission (CPSC) and Code Check Complete. Submitted by Jeffrey R. Jonas (not verified) on Tue, 10/11/2011 - 08:53. "Very nice article Joe. I really like the effect of the fully engulfed home along with the picture of the children sleeping to drive it all home." 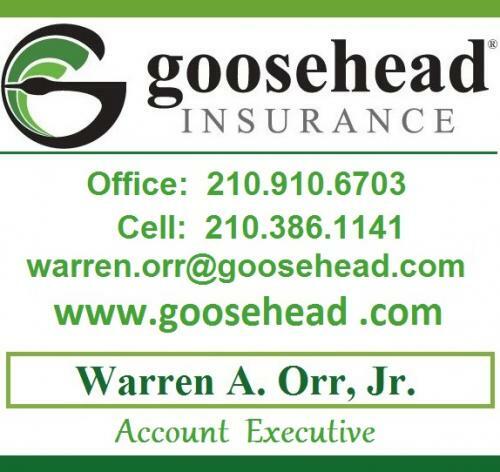 Submitted by fire damage (not verified) on Fri, 10/21/2011 - 15:52.
today, damages may be occurred more and to prevent these type of damages, this is the best option. 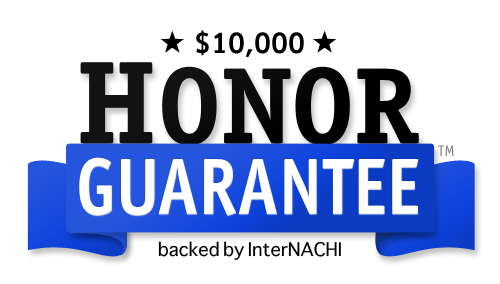 through this technique, we and our family will be safe from external environment activities and aware before some unwilling situations. smoke alarm is the notification of fire.